<!–4/5/11, Catholic Issues–>“When he had led them out to the vicinity of Bethany, he lifted up his hands and blessed them. While he was blessing them, he left them and was taken up into heaven. Then they worshiped him and returned to Jerusalem with great joy. And they stayed continually at the temple, praising God” (Luke 24:50—53). The story of Jesus’ Ascension is one that captivates our attention and wonder, and even more so, offers hope to His followers. This event is chronicled in the Gospels of Mark and Luke as well as the Acts of the Apostles. 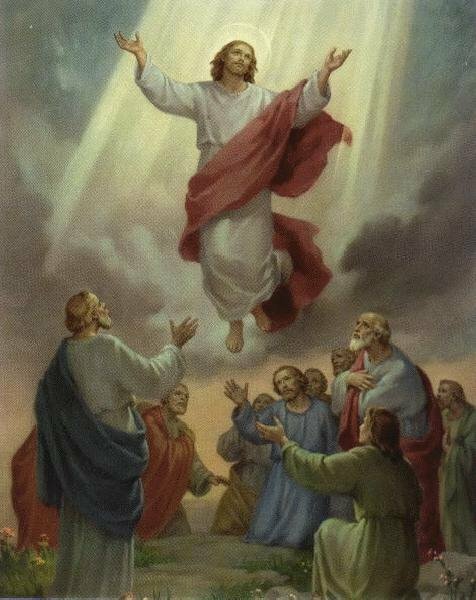 Catholic Encyclopedia defines the Ascension, “The elevation of Christ into heaven by His own power in presence of His disciples the fortieth day after His Resurrection.” Not only is it celebrated the fortieth day after Easter, but also it always falls on a Thursday. Saint Helena constructed the first memorial there, which was tragically destroyed by the Persians in 614, and rebuilt only to be decimated again, but by Muslims. The only surviving vestige is an octagonal edifice enclosing the stone purportedly imprinted by Jesus’ feet. The Ascension is integrally related to Jesus’ Resurrection. Both offer Catholics a chance to practice the theological virtue of hope. They also comprise the first two Glorious Mysteries of the Rosary. Even more so, the Ascension and Resurrection are connected with the Passion of Jesus and Good Friday. Our lives are inevitably also going to be tested with trials and suffering. However, we are consoled by trusting in Jesus and hoping that, if we faithfully follow Him, we too shall be resurrected and united with Him one day. Catholics don’t believe in the Resurrection and the Ascension as some sort of delusion. Kreeft provided the Christian response to skeptics of the Resurrection and Ascension.